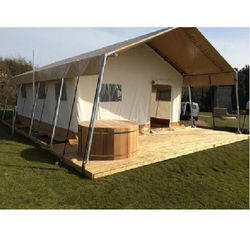 These are 100% water-proof tents, erected on easy to erect & dismantle, strong metal frames. Interiors are made of decorated fabrics. These are used by resorts on hill stations to withstand strong winds & rains. Best Quality Resort Tents are available with us. We are offering PVC Canopy Tent to our client. To furnish the diverse requirements of our clients in the best possible manner we are involved in offering an extensive range of Luxury PVC Tents. We have our own fabric imported from EUROPE which we use to manufacture these things. As an affluent enterprise of this domain, we emerge in providing premium quality array of Pagoda Tent. We are offering Outdoor PVC Tent to our client.